Details of our yoga classes just off Old Street in Farringdon/ Clerkenwell; our private one to one or group tuition; and corporate yoga and mindfulness in the workplace classes. Our classes are down to earth and welcoming, set to a contemporary soundtrack. Expect to start slow with simple warm ups, get moving and work up a bit of a sweat in the middle, and then leave feeling stretched out and relaxed after finishing with a guided relaxation. You'll learn how to work with the abilities and limitations of your own body, and how movement in time with your breath can help you regulate your stress levels. Group classes are a fun and cost effective way of practising yoga. Students learn from each other and can see and begin to understand the variations between different people’s bodies, while still benefitting from individual attention and guidance. Our group class prices are extremely competitive for central London and class numbers are strictly limited to a maximum of 17. Look for our sign on the street (we're right next door to Foxlow!) and press the buzzer for us to let you in. We have mats for everyone but only one small changing space, so if possible please arrive ready for class. To book: please click 'sign up' next to the date you'd like to attend in the schedule towards the top of this page. Our classes often sell out so spaces should be booked online in advance. In addition, all of our class passes are available to purchase as a gift. The perfect present for your friend or loved one! Have a look at our different gift cards here. Cancellation policy: If you can no longer attend a class you have booked with us, cancel with at least 12 hours notice and your class credit will go back on to your online account ready for you to use another time (please keep an eye on its expiry date!). Unfortunately we cannot refund no shows or cancellations with less than 12 hours notice. Our group classes are conveniently placed for: Farringdon, Clerkenwell, Angel, Old Street, Shoreditch, Holborn, Bloomsbury, Barbican, the City of London including Moorgate and St Paul's stations and surrounding areas. To view FLY’s schedule and to book click here. To view Mudra Yoga's schedule and to book click here. To view Yogalogy's class schedule and to book click here. To view 3Tribes' class schedule and to book click here. Our award-winning, bespoke one-to-one or small group classes can be arranged at a time and place to suit you. 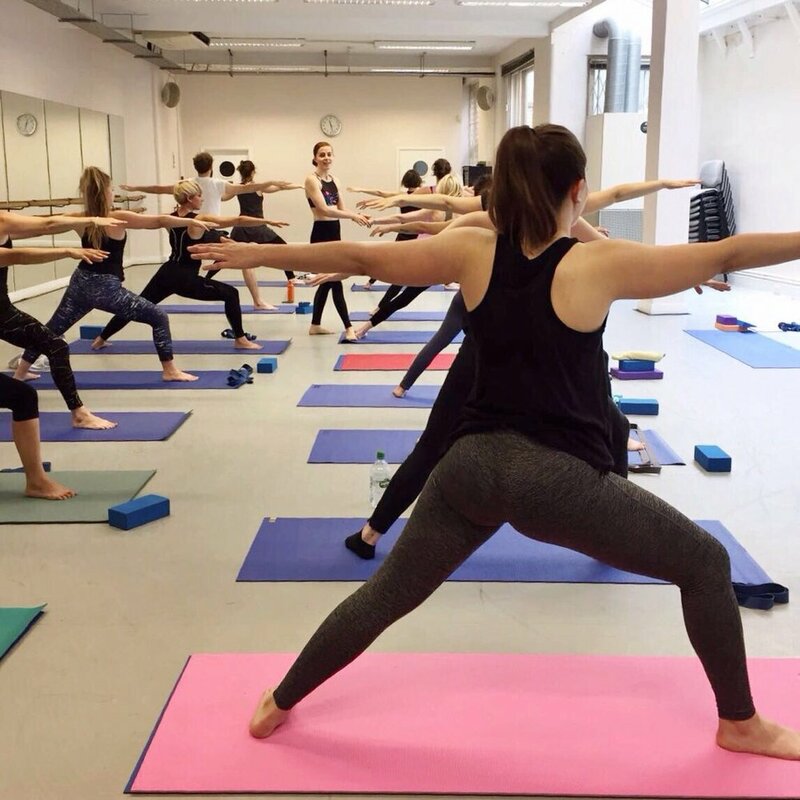 Individual tuition is suitable for anyone with specific goals for their yoga practice; people who may have certain health requirements or injuries; athletes seeking to minimise injuries; those who don’t yet feel ready to join in with a group class or anyone simply wishing to deepen their practice. They can be tailored specifically to meet your individual needs. We also offer five week courses for individuals or small groups in a range of areas; for example stress reduction, improving your posture, weight loss, strengthening, increasing flexibility or balance, working on/ towards a particular yoga pose or recovery from injury or childbirth. Private group classes are ideal for sports teams, groups of friends, hen parties, families, or community groups. Class content can be tailored to your group's particular needs, and can be a fun team building exercise. Olivia has an additional interest and specific training in working with athletes, and can meet any team or individual’s needs by bringing classes to you. Private tuition is £80 an hour, which includes your choice of a telephone or email consultation about your requirements prior to class and covers all of our travel time and costs coming to you. If five private classes are booked in one go we can offer the discounted rate of £375 for all five, which works out at £75 per hour. We can provide all mats, blocks, straps and bolsters for private classes. If you don't have a suitable location and wish to come to us that can also be arranged. Please contact us if you would like any further information. You can also purchase private classes as a gift - they can be redeemed for either one to one or small group tuition at a time and date of the receiver's choosing. Have a look at our different gift cards here. We can travel to you all over London. Or, if you'd like to come to us for individual tuition, we are conveniently located for: Old Street, Shoreditch, Clerkenwell, Farringdon, Barbican, Moorgate, Angel, Islington, Dalston, Hackney, Bank, St Pauls, Liverpool Street and the City of London. We currently run a number of popular corporate classes in central London. Yoga is excellent at preventing and/or easing discomfort or stiffness from sitting at a desk all day, can boost productivity and also be great for team building and bringing together people from different parts of an organisation. With the Health and Safety Executive stating that 11.3 million working days were lost in 2013/14 due to stress, depression and anxiety, and 8.3 million days lost to musculoskeletal disorders, one or two yoga classes a week could be one of the best investments your company makes this year. If you or your colleagues would like to feel the benefits of yoga or meditation while you’re at work we can bring classes to you. Classes can be arranged at any time of day depending on your location. Mats and any other props we might need can be provided if required.